Arriving from my Qatar Airways flight from Dubai, I went directly to the Al Safwa First Lounge. The lounge had actually been closed the week before my visit due to the heavy flooding that hit Doha causing some sort of "problems" to the lounge. Fortunately, it reopened three days before my visit. As usual, there was separate boarding for first and business class passengers which was located upstairs with direct access to the aircraft's upper deck. The cabin has a total of 8 seats in a 1-2-1 configuration just like on Emirates Boeing 777 and A380. On that morning flight to Paris, only 2 of the 8 seats were occupied. Welcome to my seat, 2K! Upon boarding, I was greeted by Akil, the Cabin Service Director from India who then handed me over to Rashpreet, a very nice lady also from India who then escorted me to my seat. Headphones and seat control located under the left armrest. Located under the right armrest is the entertainment control and a bottle of water. Qatar Airways A380 "Blockbuster Movies"
In between my "inspection of the seat", I was offered a hot towel, some chips and something to drink and I chose a glass of water. I was also offered some newspapers which I declined. Next to be offered were the arabic coffee and some dates which I also declined but not without taking a picture first. I also got the male amenity kit featuring a Giorgio Armani bag, Armani perfume, Armani All Over Shampoo, Armani Men Master Lotion and Armani Men Perfect Master which were all very nice. 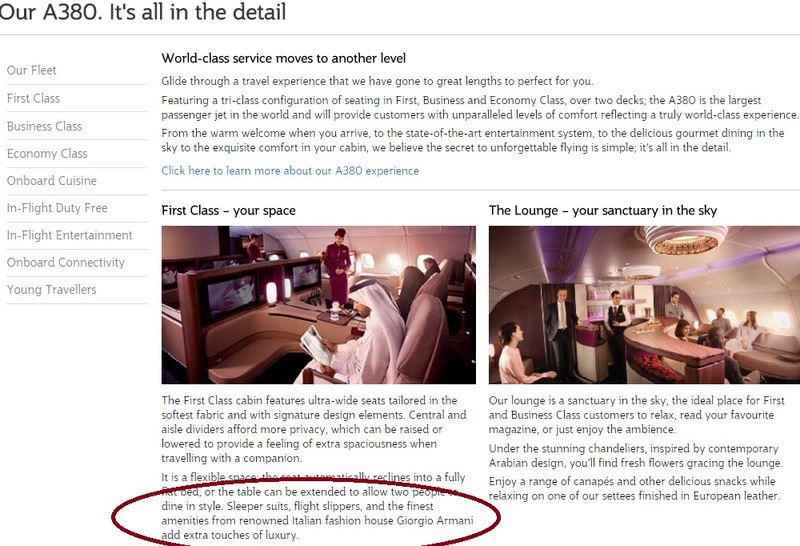 Unfortunately, there were no pyjamas given even if Qatar Airways advertises on their website about the sleeper suits for first class passengers. I was told by Akim that they only give them on overnight flights. I find it strange because on this day flight that is about 7 hours long, me and the other first class passenger were offered turn down service and yet it seemed they expect us to sleep or rest without changing into pajamas. Moreso, if they have decided to offer pyjamas only on overnight flights, then they should state it clearly on their website since a lot of people (including myself) thought that pyjamas were always offered on long haul first class flights. On one note, they used to offer pyjamas on day flights until last year so this is obviously a sign of cost-cutting. Another Qatar Airways Airbus A380. One of the coolest things about flying Qatar Airways A380 in first class is that you get a wifi code which you can use to freely surf the internet for the whole flight's duration! It was also quite fast so I was able to use Tweeter and Viber while uploading some pictures. A big plus here! I also asked for a cup of green tea and a glass of their non alcoholic champagne, So Jenny! Having taken an almost exact morning flight in Etihad First Apartment from Abu Dhabi to London a few months ago, I thought that the dining experince on Qatar Airways was really subpar. The choices were just underwhelming for a first class flight. On the other hand, I liked the way my appetizer tasted. After my meal, Rashpreet offered to do the turndown service and since no pajamas were offered, I had to use my own Etihad pajamas which I got a few days earlier on the London to Abu Dhabi flight. About two hours before landing, I thought I'd order something from the light options. There are two lavatories on Qatar Airways Airbus A380, one on the left and the other on the right side of the cabin. There is also some sort of an "ash tray" on the lavatory door wall. Or at least a reminder that you are not allowed to smoke. The self-serve bar located between seat 1K and the lavatory, offered some popcorn snacks and bottles of mineral water. From The Lounge, I asked Ivana, the barwoman from Zagreb to make me a glass of Mango Fizz which was excellent. Before landing, Akil came to my seat once again to thank me for flying with them and to apologize for not being able to offer the pajamas on this flight. The flight was actually very smooth and we arrived in Paris about 30 minutes ahead of schedule. While getting off the plane, immigration fast track cards were handed to the first and business class passengers. Having flown in Emirates First Class and Etihad First Apartment in the past, I thought it was about time to try what Qatar Airways had to offer on their Airbus A380. While both Emirates and Etihad installed shower spas for their first class passenger, Qatar Airways opted to keep their cabin simple without it. The Lounge on the other hand was really beautiful and could easily be on par with what Emirates and Etihad offer, if not better. I thought the seats were okay and comfortable although the lack of privacy was something I would have preferred. Regarding the food, I really thought the choices were subpar. The issue with the pyjamas was also something I was disappointed specially when they are advertising it on their website. The staff were very friendly and did their job well, as usual. Overall, this is a nice flight and could be better if they improve on some aspects.